It’s no secret that I looooove planners, but I haven’t always loved them. In fact, I used to be one of those people who would go out and buy a planner, spend time filling in the addresses and all the other info sheets and then after a month or so it would start collecting dust, forgotten unless I needed an address that wasn’t in my actual address book. (Pre-smart phone era there) Then about 9 years ago, right around the time I was going through the evaluation for ADD, my Dad gave me a planner. It was just a simple, basic planner but his reason for giving it to me was so much more. It was one of the moments that set me on the path to taking control of my time. 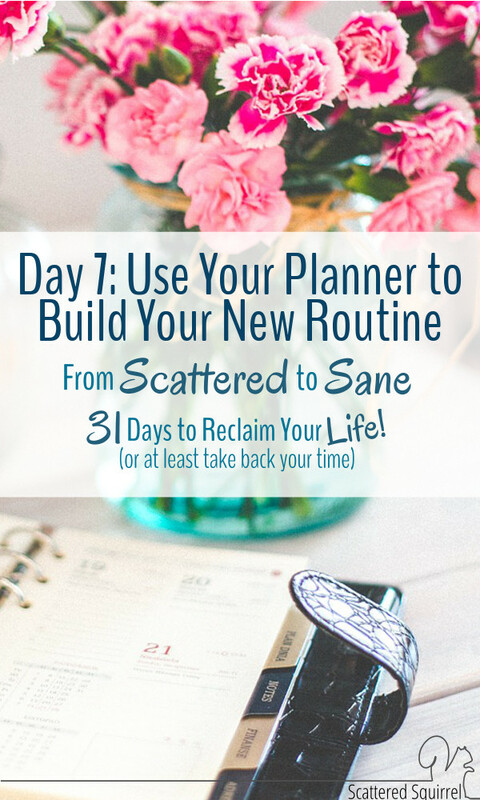 You see, my Dad didn’t just give me a planner that day – he gave me the beginning of the system I’m sharing with you this month, Today I’m going to show you how you can make use of your planner to help you build your routine. When my Dad first explained his thoughts behind how I could use his gift to help me create some structure to my days, I was excited by the idea but also a little unsure. Up until this point I hadn’t had much luck with planners in the past, but with his general idea and some suggestions from Travis and my Mom, I found myself getting on board. More importantly I found myself falling in love with that planner and the way it seemed to help change my life. There are many ways you can use your planner to help in everyday life. Earlier this year I shared a post about how I use my planner to achieve my goals. I know many people who keep their whole lives in their planner. They keep track of spending, what they ate, their meal plan, shopping list and work and household routines, as well as their appointment and what not, all in their planner. Planners are really versatile that way. And once you’ve found or created the planner that works for you, you’ll find that it really does help keep things running smoothly. A planner is also a really great tool to have on hand when starting a new routine. 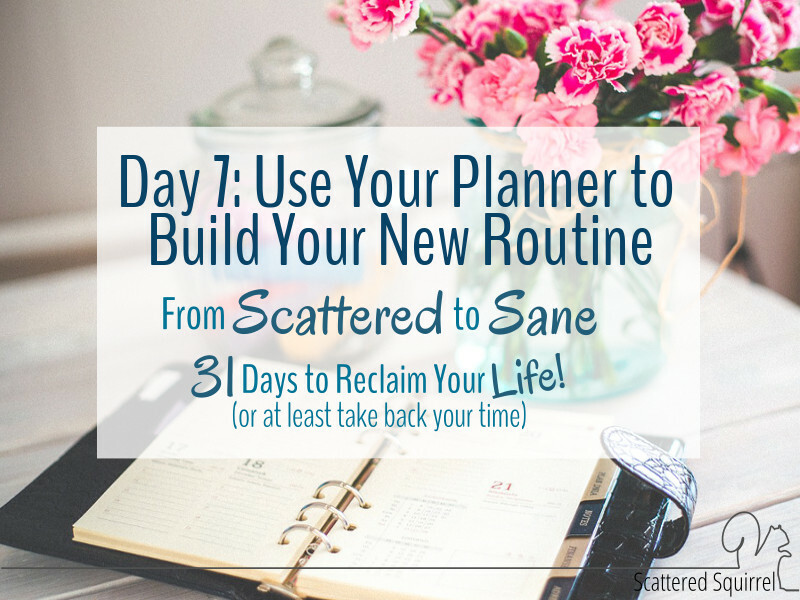 There are a number of ways you can use your planner to help you as you build your new routine. For this to work, I strongly recommend using a daily or weekly planner, as a monthly planner just does afford enough room. Take a look at your top three tasks that you chose on day 3. By now you probably have a general idea of when during the day is best for you to tackle those three things. If you’ve tied one or more of those to existing routine then you have a really good idea of when you’re going to do them. Take a few minutes and schedule these tasks into your planner for 1 week. We’ve only been focusing on our three tasks for a few days, so this next part might be more of a guess, but I want you to think about how long it takes you to complete these tasks. For example, I can quick clean one bathroom in 5 minutes. Add in a buffer, I generally add half the amount to my estimate, so 5 minutes would be 7-8. This way if it takes a little longer I don’t feel too bad, and if it takes me less time – well it just feels good to get finished ahead of time doesn’t it? Beside or under where you wrote your tasks in your planner, add that time so you know at a glance how long it will take. Each day when you check your planner you’ll be reminded not only of the three things you’ve chosen to focus on, but when is best for you to do them and how long they’re going to take. Continue writing them into your planner for at least one month. They say it takes 21-28 days to form a new habit. I’m a pen and paper girl myself, but I can certainly see the appeal of going digital when addressing your planning needs. The biggest advantage of digital planner, in my opinion, is the ability to set reminders and alarms to help you remember the important things you need to. I wish my paper planner could do that. If you prefer to use a digital planner, whether you use something like Google Calendar or a planner app like The Simplified Planner App, you can still use this idea. Follow the same steps as above. If you like to utilize reminders to help keep you on track, go ahead and set those up while you’re at it. The only difference I can see, is that instead of writing the time beside the task, you could set the duration time of your event for how long it should take you. This is the part that really helps to get things done, and was my Mom’s suggestion way back when I first started really using my planner. Set your timer for the time you have written down in your planner, and go do that task. If you want to, race the timer and see how fast you can get it done. This little trick of using a timer is something that seems to have gained popularity in the years since my Mom first suggested it to me. Or maybe I’m just more aware of it now. Regardless it helps in so many ways. Just like I mentioned on Day five when I urged you to start where you are, if you’re having a hard time getting started on a task, set your time for five minutes and focus only that task until it beeps. You’ll be surprised how much you can get done in five minutes, and often times you’ll find yourself finishing because you’re already halfway there, or maybe because you found your groove. 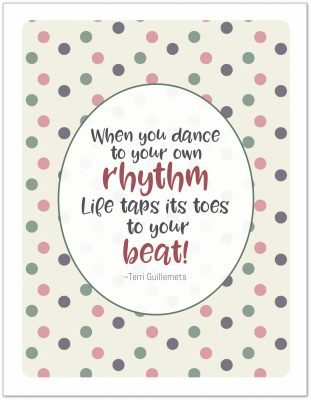 Science has shown that energy begets energy, and that applies to tackle our routines and time management systems too. Once you get started, it’s easier to get started. So use your timer, schedule your tasks and help yourself succeed on this journey to go from Scattered to Sane. Don’t worry if you miss some days, we’re all only human and it happens to all of us. Take it one day at a time. If you missed one of your tasks today, make it the first thing you do tomorrow if you can, or make it a point to remind yourself about. If you keep trying it will start to stick and pretty soon you’ll find that you don’t think about having to do to them anymore. Until then, use your planner or your phone, or your computer to help give yourself that added accountability. Even those who built Rome uses tools. So how are you doing on this challenge? Drop me a line a comments or head on up to my contact page and send me an email. I would love to hear from you!